Tropicana’s Brighter Mornings for Brighter Days campaign was given a new sense of meaning this year with Arctic Sun, an ambient stunt in the NorthWest Territories of Canada. 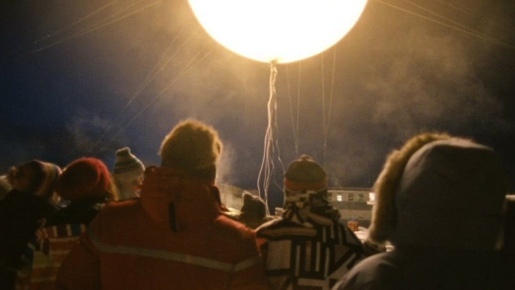 BBDO Toronto sent a documentary team to the town of Inuvik, population 3450, to raise a huge helium filled balloon glowing with 100,000 lumens of light as the town emerged from weeks of darkness. The marketers also provided a free carton of Tropicana to every household in the community. Breakfast Television covered the making of the ad. The company’s Facebook page fan numbers swelled in response. The campaign won the Grand Fabulous Award 2010 (Food and Beverages Advertising). The Arctic Sun campaign was developed at BBDO Toronto by creative director Ian MacKellar, copywriter Adam Bailey, art director John Terry, agency producer Dena Thompson, planner Dino Demopoulos, account managers Tim Welsh, Sheng Sinn, Adam Jardine. Filming was shot by director Samir Mallal via Film Group, Vancouver and Radke Film Group, Toronto, with executive producer Michael Haldane, line producer Michael Haldane, director of photography Chris Mably. Editor was Ross Birchall at Bijou Editorial, Toronto. Music and sound were designed at Apollo Studios by Didier Tovel, and Cherry Beach Studio, by engineer Inaam Haq. “The Great Escape” by Patrick Watson. Media was managed by OMD Canada, Toronto, by managing director Lori Gibb, group director of strategy Daniele Boem and broadcast buying group Nancy Haggith and Raquel Mullin.